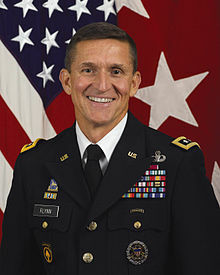 Michael Thomas "Mike" Flynn (born December 1958) is a retired United States Army lieutenant general who last served as the 18th Director of the Defense Intelligence Agency, from July 22, 2012 to August 7, 2014. On November 18, 2016, President-elect Trump's transition team announced via press release that Trump had named General Flynn his National Security Advisor. On February 13, 2017, he resigned following news reports about his communications with the Russian ambassador, and additional reports that he had misled the Vice President about them. On December 1, 2017, he pleaded guilty of lying to the FBI about the affair. Very few Americans—indeed very few Western leaders who, from time to time, use the word “war” and promise to “win” it—seem to recognize that a global war is being waged against us. Even the few who follow the actual combat tend to see the events separately: there’s fighting in Syria, Iraq, Yemen, and the Sinai, terrorists are at work all over the place, and we try to figure out what to do in each case. Most Americans mistakenly believe that peace is the normal condition of mankind, while war is some weird aberration. Actually, it’s the other way around. Most of human history has to do with war, and preparations for the next one. But we Americans do not prepare for the next war, are invariably surprised when it erupts, and, since we did not take prudent steps when it would have been relatively simple to prevail, usually end up fighting on our enemies’ more difficult and costly terms. One night at Socko and a year of probation were no comparison to the punishment at home. My rehabilitation was one of the fastest in adolescent history. I had it coming, and it taught me that moral rehab is possible. I behaved during my term of probation and stopped all of my criminal activity. But I would always retain my strong impulse to challenge authority and to think and act on my own whenever possible. There is room for such types in America, even in the disciplined confines of the United States Army. I’m a big believer in the value of unconventional men and women. They are the innovators and risk takers. Apple, one of the world’s most creative and successful high-tech companies, lives by the vision of transformation through exception. “Here’s to the crazy ones,” Apple’s campaign says. “The misfits. The rebels. The troublemakers. The round pegs in the square holes. The ones who see things differently. They’re not fond of rules. And they have no respect for the status quo. You can quote them, disagree with them, glorify or vilify them. About the only thing you can’t do is ignore them. Because they change things. They push the human race forward. And while some may see them as the crazy ones, we see genius. Because the people who are crazy enough to think they can change the world, are the ones who do.” If you talk to my colleagues, they’ll tell you that I’m cut from the same cloth. My military biography starts badly. I was a miserable dropout in my freshman year of college (1.2 GPA), enlisted in a delayed-entry Marine Corps program, went to work as a lifeguard at a local beach, and then came the first of several miracles: an Army ROTC scholarship. Little did I know that my rebellious activities, such as skipping class and sundry other mistakes, would lead me to playing basketball (which I was very good at) with an ROTC instructor who saw something in me. Not only that, he took surprising initiative. The U.S. media is doing a bang-up job of reporting the Erdoğan government’s crackdown on dissidents, but it’s not putting it into perspective. Lock her up, that's right. Yeah, that's right, lock her up! I'm going to tell you what, it's unbelievable, it's unbelievable. If I did a tenth, a tenth, of what she did, I would be in jail today. My guilty plea and agreement to cooperate with the special counsel’s office reflect a decision I made in the best interests of my family and of our country. I accept full responsibility for my actions. Lt. Gen. Michael T. Flynn, a Trump national security adviser, has been paid by Turkish money laundered through a Dutch company to lobby on behalf of the Turkish government. More than bad judgement, Flynn’s egregious conduct raises ethical questions. It also casts doubt on his suitability for public office. Flynn’s pro-Turkish positions compound concerns arising from his judgement and ethical lapse.